Day ten of the 30 Paintings in 30 Days has arrived. I chose "Harmonica Hummingbird" for today's alliterative title. I enjoyed painting the wings of the hummingbird and making them look like they were in motion. This was done with some wet-in-wet watercolor techniques and negative painting around the lighter feathers. I used Ultramarine turquoise and Prussian blue for the blue green feathers in the hummingbird. Prussian Blue also appears in the background blue and was mixed with burnt sienna and Quinacridone Magenta to create the dark brown of the harmonica box. 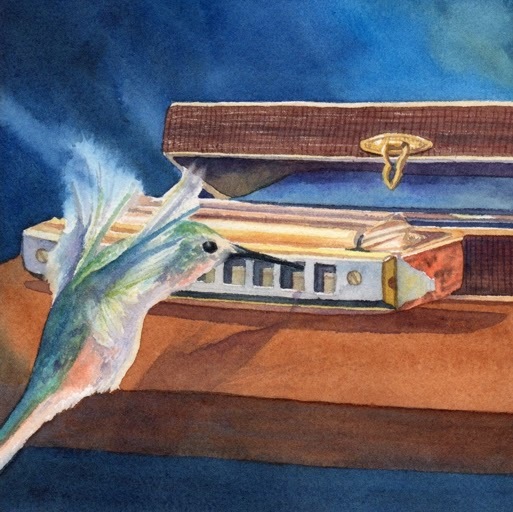 "Harmonica Hummingbird" is a 6"x6" watercolor and is available for purchase at Daily Paintworks for $90. Click here to purchase.